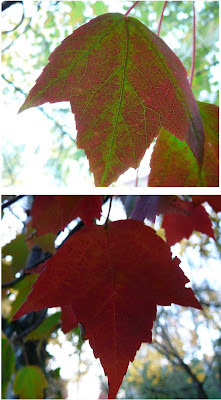 Why do leaves change color and turn red? "... Chlorophyll, which gives leaves their basic green color. It is necessary for photosynthesis, the chemical reaction that enables plants to use sunlight to manufacture sugars for their food. Trees in the temperate zones store these sugars for their winter dormant period. Carotenoids, which produce yellow, orange, and brown colors ... Anthocyanins, which give color to such familiar things as cranberries, red apples, concord grapes, blueberries, cherries, strawberries, and plums. They are water soluble and appear in the watery liquid of leaf cells... Both chlorophyll and carotenoids are present in the chloroplasts of leaf cells throughout the growing season. 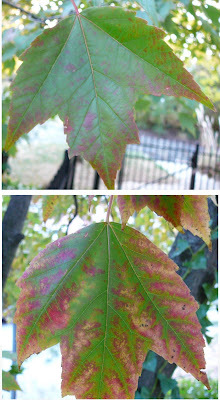 Most anthocyanins are produced in the autumn, in response to bright light and excess plant sugars within leaf cells. During the growing season, chlorophyll is continually being produced and broken down and leaves appear green. As night length increases in the autumn, chlorophyll production slows down and then stops and eventually all the chlorophyll is destroyed. 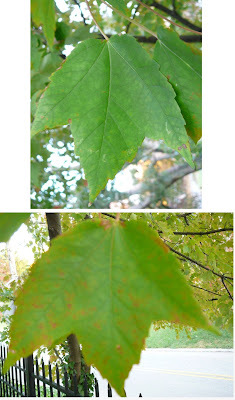 The carotenoids and anthocyanins that are present in the leaf are then unmasked and show their colors ..."